Drawing on innovation and his diverse interests, Professor Kevin Hall is contributing to the University’s global research success. The University of Newcastle is a research-led university built on the foundation of discovery and access to new knowledge. At the helm of this discovery is Professor Kevin Hall, an accomplished civil engineer and the University’s Deputy Vice-Chancellor (Research and Innovation). “I have the best job on campus,” he acknowledges. "I’m lucky to have a hand in nurturing the careers of some of our boldest and brightest." It’s gratifying being able to bring in the next generation of experts and watch them grow as articulate, empathetic and inspiring thinkers and doers. Running his own hydro technology company for seven years between his undergraduate and PhD studies, Kevin has been a visionary from the very beginning. Designing a handful of the world’s most beautiful and mechanically sound harbours, marinas and beaches before undertaking a PhD at the University of New South Wales, the Canadian native didn’t expect to “enjoy” research so much. “I saw it purely as a business advantage,” he confesses. Deciding not to return to the corporate realm after receiving his award in 1986, Kevin joined Canada’s Queen’s University. As somebody who likes to be involved in a “variety of things,” he undertook research in a number of different areas. “For a long while, my primary area of strength was numerical modelling, which uses equations and other mathematical techniques to represent natural processes,” he explains. “A national event involving pathogens caught my attention however, and expanded my focus. Dually exploring water quality and its impacts on health, Kevin’s multidisciplinary effort also prepared him for successful partnerships across a number of sectors ranging from public health to coastal protection. Several members of his research team developed design techniques for artificial surfing reefs which also provided shoreline protection. Kevin relocated to the University of Guelph in southwestern Ontario in 2008, signing on to become its Vice-President (Research). Though conceding the executive role to be a “one and a half time job by itself,” the distinguished educator and innovator affirms he still made plenty of room for research. “For the past 20 years I have been working in the urban slums of India and Africa where there is no infrastructure, sanitation, or fresh drinking water,” he conveys. 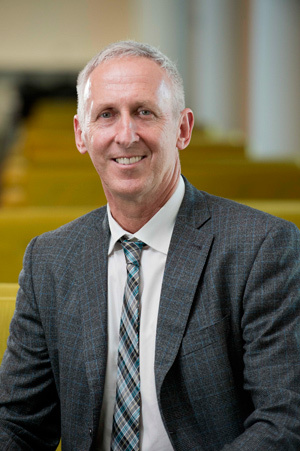 Kevin returned to Australia in March 2014, accepting the position of Deputy Vice-Chancellor (Research and Innovation) at the University of Newcastle. Continuing to work with his head and lead with his heart, the sharp strategist admits this newest role is as demanding as it is rewarding. “I’m an enthusiastic and vocal supporter of our researchers,” he shares. Kevin is also pushing the frontiers of a burgeoning academic arena – interdisciplinarity. “By being made aware of who’s investigating what, I can link people together, like our powerhouse respiratory medicine network with scientists from the Hunter Valley, Sweden, Britain, North America and Singapore,” he affirms.